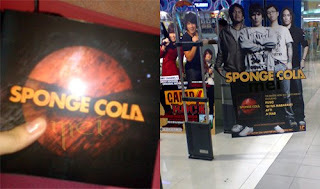 I just bought my copy of Sponge Cola's third album! Here's my thoughts about the Sponge Cola's self titled third album. This was released last Saturday and by Monday I bought it! The album opens with “Ayt!” with a line “I dilat ang iyong mga mata”. The song encourages positivity and my gut tells me that this is entitled “Ayt” because the band wants us to agree and respond to their challenge. “Puso” is the first single off the album. I've heard it first on UAAP basketball opening and closing billboards. “Dehado..Wag ka sanang magkakamaling sumuko na lang” I know its Yael. The band have produced a lot of inspirational-hero-themed-OST like songs in Boundless, Bitiw, Tuloy pa rin and now Puso. The signature catchy pop rock vibe is present on Filipino tracks like “Wala kang katulad” & “Makapiling ka”. I easily embraced both songs and found myself singing along on second round of Sponge Cola playlist. I can't help to sing Yael's part and the back up vocals for the later. In terms of variety, the album have something to offer, “Di na mababawi” is an acoustic track – a calm song yet the message is full of cold words to a lost lover (Who hurt you Gosh? :P) . While "G.K.T" is a wacky song featuring Jomal of Kamikaze. This is a pleasant surprise for all the K.L.S.P. A potential single is “Lights” with a bouncy tune and ironic line “Close your eyes..to see the light”. The track “Meteor Shower”, for some unknown reason reminds me of Ely Buendia's Wanted bedspacer. I don't know why, how, when, where. They also included old songs from 2003 EP, “A tear” & “Saturn”, that sounded so much better because of better production. I guess this is part of Yael Yuzon's unrequited love songs series. The 14th & final track is “Keep the Fire Burning”. I almost cracked up when I heard the second voice “Nasaan ka man” but I like the to-doo-doo chant. The song started slow but ended with a bang and on a positive note. Sponge Cola's third album is solid, in terms of production value, musicality – I'm speaking as a fan who supports the band for years now & have seen their growth. They've come a long way from “Palabas”, (third year college) their first try, was recorded on Yael's room with raw sound and talent - a good(songs) & bad(production) thing. Their sophomore album “Transit” (graduated from college) represents movement in terms of the direction of their music and the band. Now the third album (2 years working) is self titled, which means that this is the music that represents them?! By the way, the album packaging gets thinner and thinner BUT I'll vouch that it's inversely proportional to the album quality!